If like me you grew up in the 1970’s & 80’s with parents who survived rationing, the word leftovers probably doesn’t get you excited. Leftovers simply meant yesterday’s dinner, re-heated. And so the concept of taking some leftover food and turning it into a completely different and tasty dish, has been a revelation. The fact that you can actually do something new and exciting with ‘leftovers’ has perhaps been the single most helpful action in helping me reduce my food waste. The first step was the Sunday roast which, in our house was the very epitome of leftover cuisine, with Monday’s evening meal being an inferior representation of Sunday lunch. But what else can you do with any meat leftover from a roast? I always found this a challenge, until I discovered that if you put your leftover roast meat through a food processor and turn it into mince, there are absolutely loads of new and interesting things you can do with it. Favourite with my kids right now are lamb meats balls. In fact, lamb is now their favourite roast because they know they will be getting meatballs on the Monday. I am now a devoted ‘mincer’, including with any meat leftover from BBQ’s. So that’s the meat, but what about the veg? Hugh Fearnley-Whittingstall had a good tip for this on his War on Waste series on BBC1. Make it into soup; any veg, any soup, it really doesn’t matter. I do this a lot now, not only with leftover cooked veg but also with any veg that’s soon going to be past its best. Just put it all in a big pan, add some stock and seasoning, let it simmer then blitz it all together…simple as that. You may want to add potatoes, or else it can be quite runny. His top tip is to add a little curry powder if you think it’s too bland or if one flavour is very dominant. I did this last Christmas after Christmas dinner. I chucked everything in except the meat, leftover stuffing, cranberry sauce, gravy the lot. It was delicious and I didn’t have a fridge full of funny smells to wake up to on Boxing Day. If you aren’t going to eat it right away, you can freeze it. Home made soup, packed full of veg , perfect for lunches. Mashed potato is another thing I struggle to judge correctly. Simply shape leftover mashed potato into portion sized balls then open freeze them on a tray in the freezer before transferring to a container. I do this all the time and it’s a great stand by. You can defrost it in the microwave in a couple of minutes and loosen it with a little milk or butter. Bread is one of the biggest culprits when it comes to food waste. We throw away about 40% of all the bread that we buy! We need to learn to use up that leftover bread that’s possibly a bit dry round the edges, or the crusts that no one will touch. Breadcrumbs is the obvious answer, store them in the freezer if you don’t need them straight away. Use them on top of pasta bakes or to thicken soups or sauces or in meatballs (all made from your leftovers, naturally!). You can find loads of recipes on the internet for using leftover bread. Leftover rice is also a problem in my house. It’s not that I don’t measure it out, I do, but I realise I also need a crystal ball to properly gauge how much my kids are going to eat. So it’s good to know there are loads of things that you can do with leftover rice, just make sure you cool it quickly and keep it in the fridge. How about rice pudding? In a large pan just combine the rice with the same amount of milk and a little sugar and salt. Simmer it for 20 minutes until it has thickened then stir in about 1 teaspoon of vanilla extract. If the fruit in your fruit bowl is past its best and everyone is turning their noses up at it, try stewing it or blitz it and put it in a smoothie. When it comes to leftover food, the trick is to have a few options up your sleeve for the food that you know gets most leftover or unused in your house. Leftovers to me are like ‘free food’. A meal I’ve created without having to spend any more money or go to the shops, and somehow I always feel prouder of my leftover creations than I do with meals I’ve cooked with new ingredients. It’s a winning combination of thriftiness, creativity and environmental friendliness, just don’t call it leftovers! Here’s a handy recipe for using up bananas that are past their best. We throw away about 20% of all the bananas we buy so this recipe will come in handy. You will need about 12 muffin cases and a baking tray. Sieve the flour, baking powder, bicarbonate of soda, salt and cinnamon into a bowl. In another bowl whisk together the bananas, sugar, egg and butter. Now sieve the dry ingredients into the wet and fold it all together. 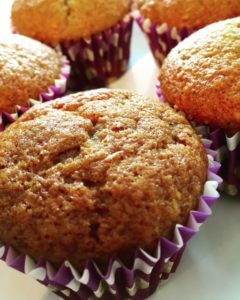 Transfer the mixture to muffin cases and bake in the oven for 25 – 30 minutes. I remember beef risotto on Monday evenings, with leftover roast beef. Mum’s take on Italian! It was our least fave meal! Funnily enough my parents went in the opposite direction – after being post war they were happy to have the option to just throw things away. Now they’re in their 70s they seem to be coming around to being more resourceful again. Thanks for the recipe – I’ll add to my list to try!